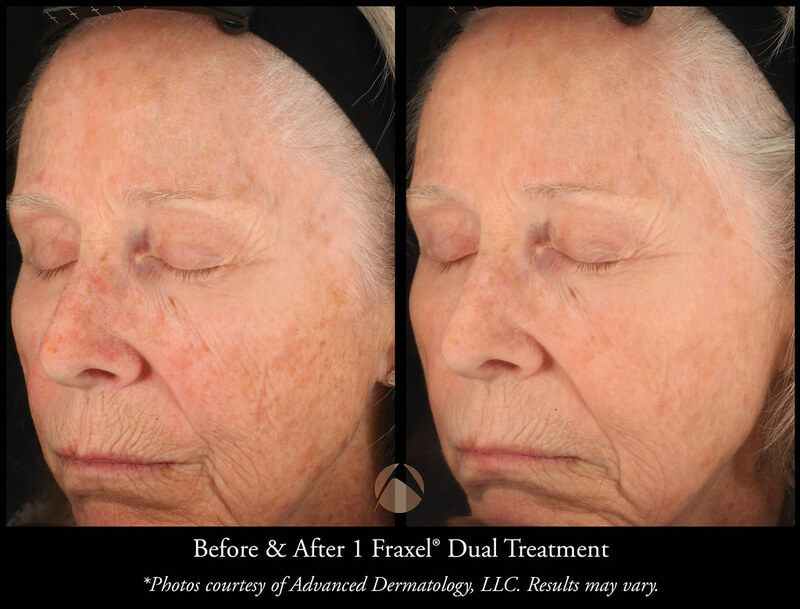 Fraxel® Laser Treatment is a revolutionary laser therapy that produces thousands of tiny but deep columns of precisely wounded skin, known as microthermal zones (MTZ). 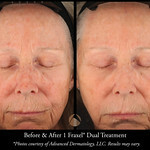 This is based on a grid and this "fractional" treatment allows the skin to heal much faster because there is normal skin between the wounded areas. 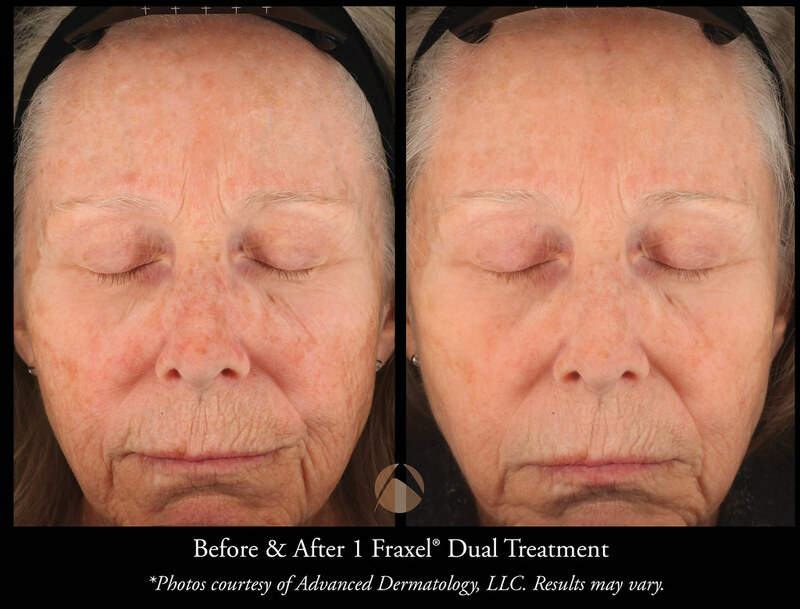 Fraxel Laser Treatments improve textural surface irregularities, scarred areas , fine wrinkles, sun damage and possibly melasma. It is also safe to use on difficult to treat areas such as neck, arms, hands, chest, as well as tanned skin or skin of color. 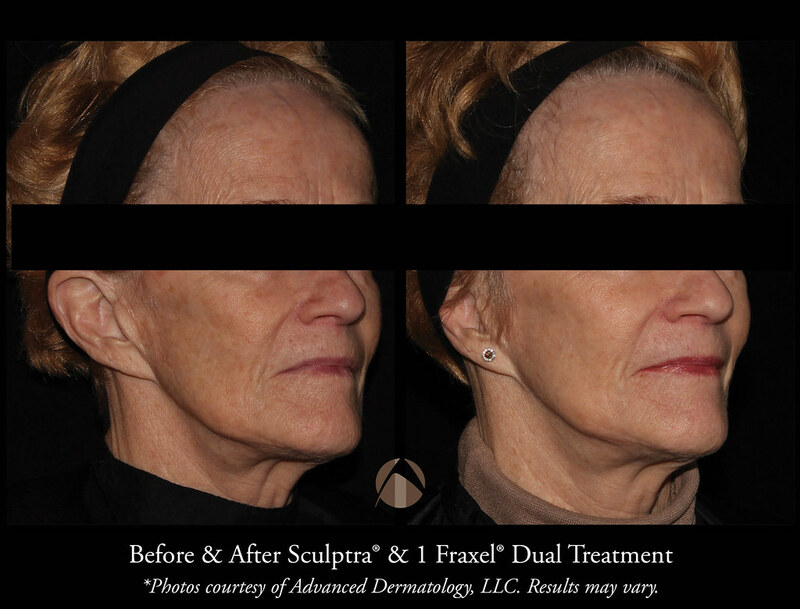 This was a major advance when developed, as no other treatment device at that time was as safe for skin of color to remove textural or pigment abnormalities and remodel scars. It is still a groundbreaking technology which can penetrate deeply into the dermis (middle layer of skin), allowing us to break up scars and deeper pigment or skin damage. Since the initial Fraxel, which was known as Re:Store, the laser has been upgraded and now is called Fraxel Dual . 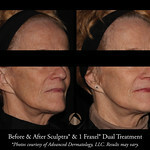 Advanced Dermatology is one of only a handful of practices in Illinois that have this upgrade. This was named because it has two diffferent wavelengths, the Re:store wavengeth which is 1550 nm and the Thulium laser which is 1927 nm. 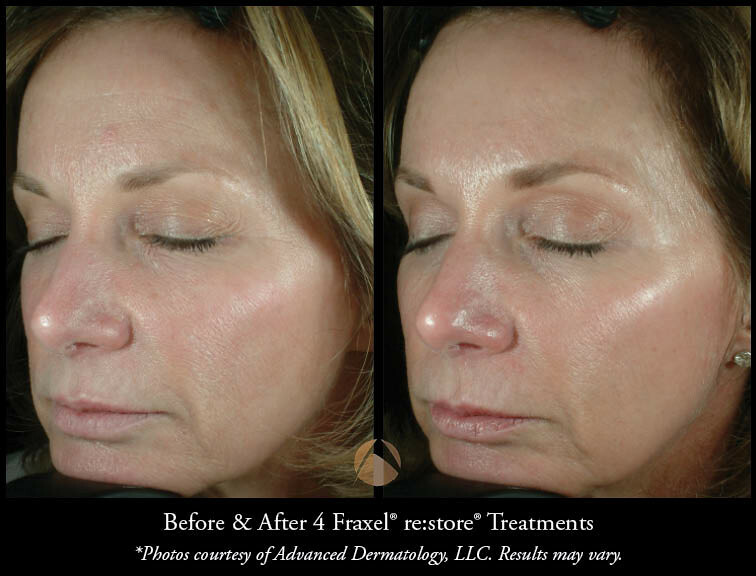 The Re:Store works better for scars and deeper wrinkles whereas the Thulium helps with superficial sun damage including fine wrinkles and sun damage, and occasionally melasma. These wavelengths can be used by themselves or together. 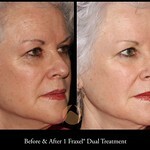 When used alone we call the procedure the Thulium or Re:Store, when used together we call the treatment Fraxel Dual. 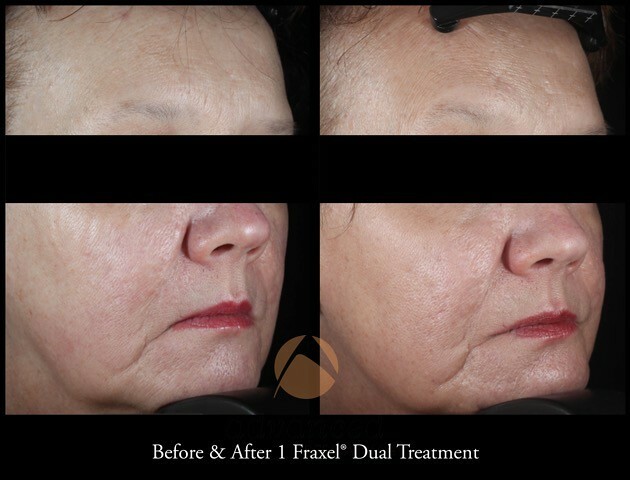 Fraxel Laser Treatment is cleared by the FDA for soft tissue coagulation, skin resurfacing procedures, and for correction of periorbital wrinkles and pigmented lesions, including age spots, melasma, sun spots and skin discoloration as well as actinic keratoses. 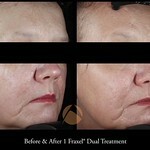 How do I know if I need Fraxel? 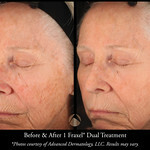 Good candidates for this procedure are people with skin of any color who have sun-damaged, aging skin, melasma, irregularly pigmented skin, mild to moderate wrinkles, acne scarring, irregular texture of the skin or other skin condition that could be expected to be improved with this treatment that understands the risks, costs and time necessary to achieve the full benefit of the procedure and who has realistic expectations of the ultimate outcome. If you are pregnant, have been on Accutane within 6 months, or have an active cold sore you should not have this procedure. 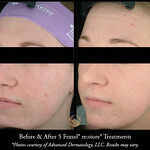 In addition, patients who have a history of keloid scarring should not have this procedure. 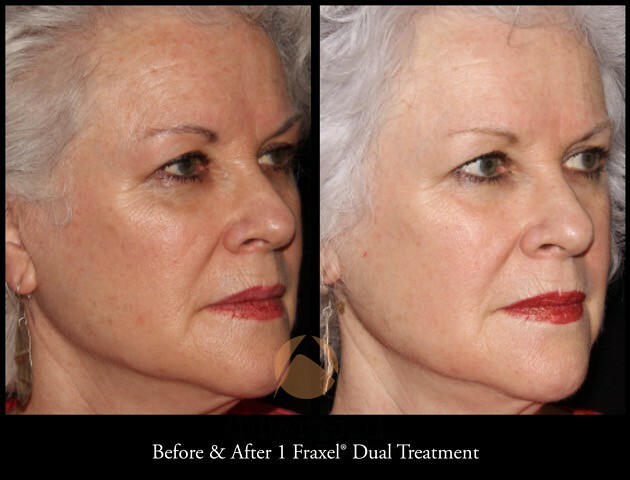 The Fraxel laser penetrates the thickness of the skin with many microscopic laser beams. 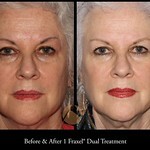 This removes damaged skin by “fractions”, allowing the skin to heal rapidly. 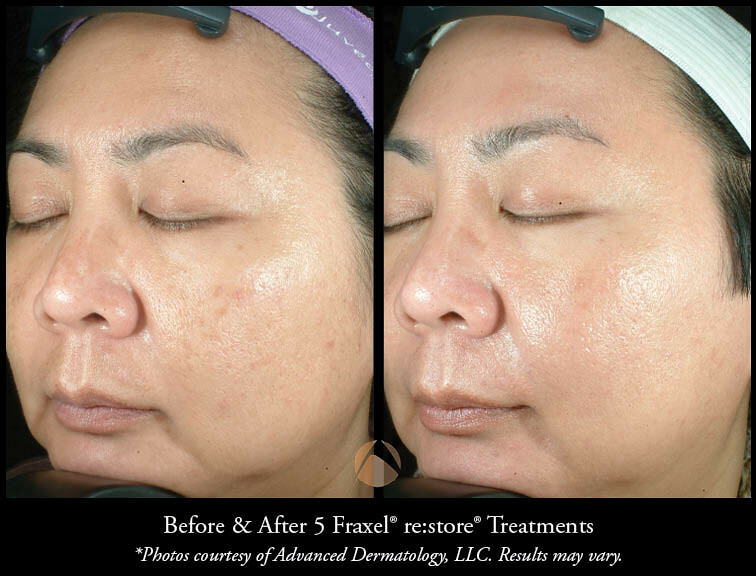 Fraxel Laser Treatments improves textural surface irregularities, scarred areas, fine wrinkles, sun damage and possibly melasma. It is also safe to use on difficult to treat areas such as neck, arms, hands, chest, as well as tanned skin or skin of color. 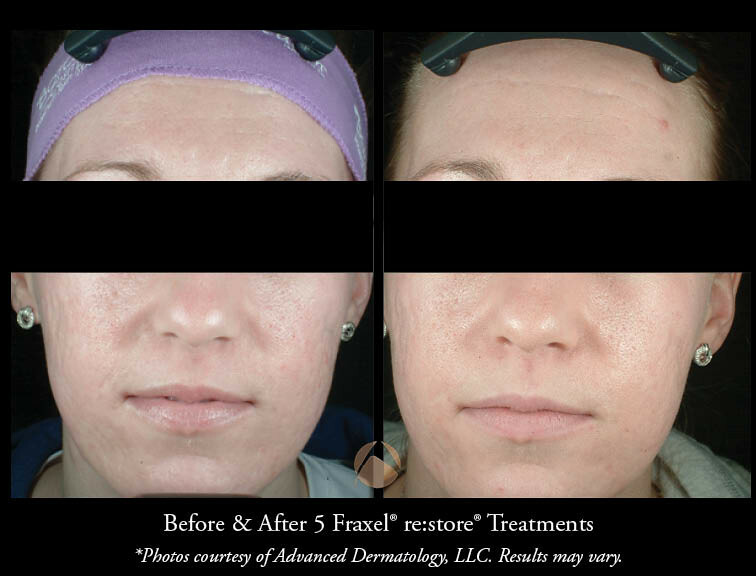 This was a major advance when developed, as no other treatment device at that time was as safe for skin of color to remove textural or pigment abnormalities and remodel scars. It is still a groundbreaking technology which can penetrate deeply into the dermis (middle layer of skin), allowing us to break up scars and deeper pigment or skin damage. 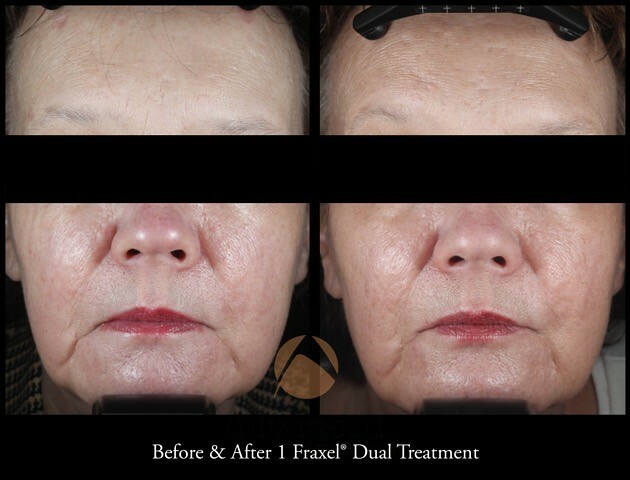 Significant reduction of superficial wrinkles, brown spots, dull skin tone and rough texture would be expected with the Fraxel Dual after 2 treatments, although it may occasionally take more. 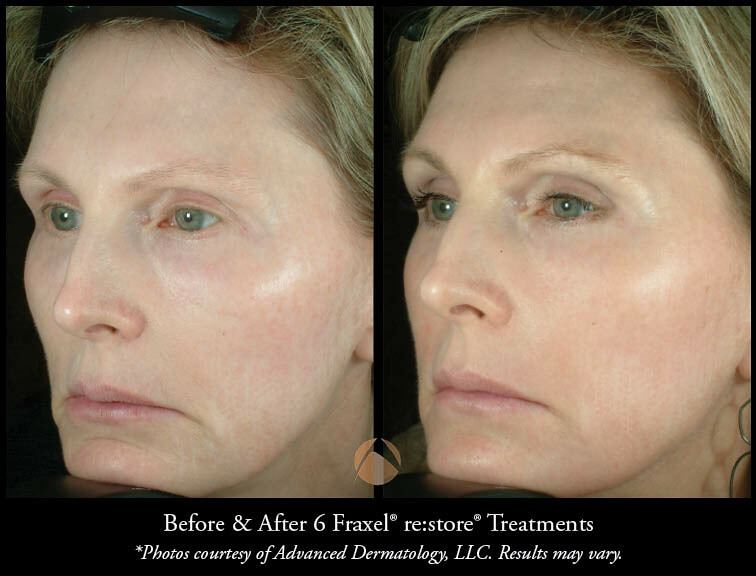 When we are treating scarring we usually use the Re:Store alone; it often takes 5 treatments to achieve optimal results, as scarring is one of the most difficult things to treat. 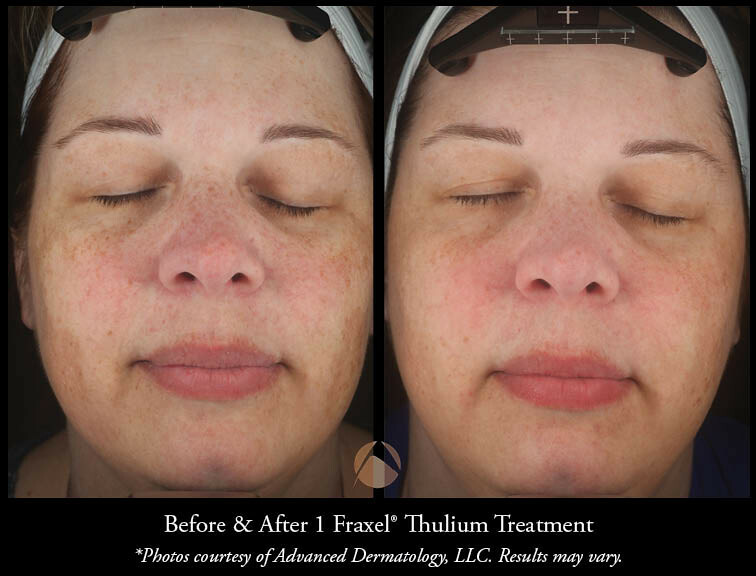 For the treatment of melasma in lighter skin individuals, we use the thulium alone and find that 2-3 treatments are effective. 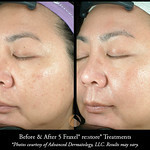 However, melasma can recur quickly, and usually does within 6-8 months. 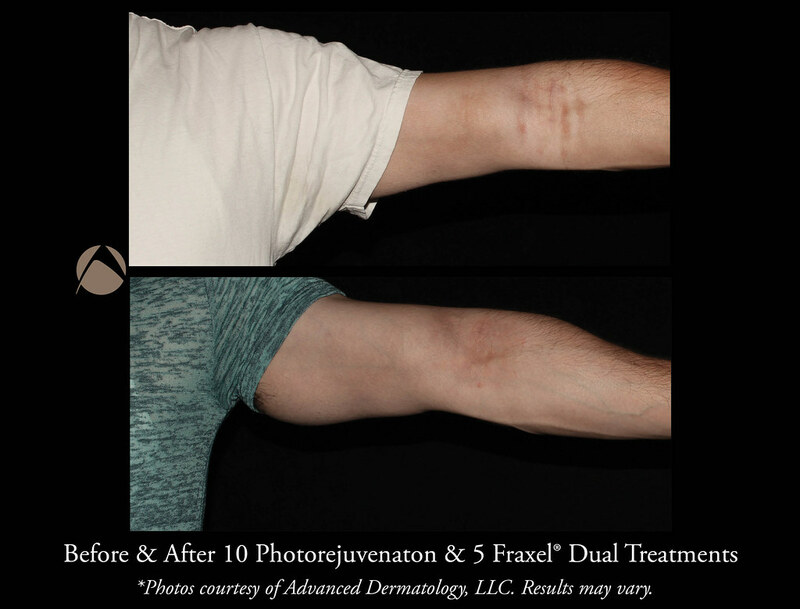 We take high quality before and after photographs with a VISIA CR to analyze the improvement, a complimentary service we provide with all cosmetic treatments at Advanced Dermatology. 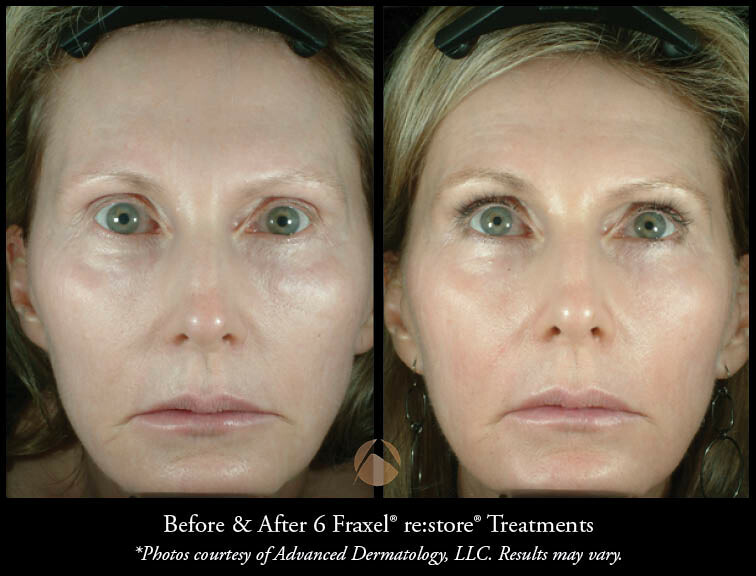 Over time you may need additional treatments because gravity, aging, sun exposure and expression of old sun damage will work to affect your skin. It is important to stay on the professional skin care regimen that has been recommended to you to maintain your improvement, as well as to practice good sun safety. Discomfort is the main negative of this procedure. 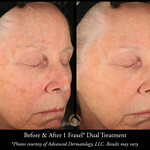 Despite strong topical anesthetic put on the face for as long as one hour and the use of very high intensity cold air, this procedure is still uncomfortable. If this causes anxiety we can either administer nerve blocks or give oral pain and anxiety medications (although the latter would mean that you would need someone else to drive you home). There is usually a couple of days to as long as a week of swelling and redness, and in the case of the thulium or the dual there is some peeling that can last a number of days. 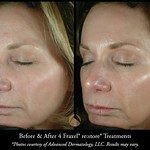 During the healing period and after the treatment the areas treated will be more sensitive to sunlight. Proper sun protection should be worn at all times to minimize possible complications from sun exposure. Uncommonly, a skin wound such as superficial blisters and scabbing can occur, which heal usually uneventfully within 2 to 14 days. 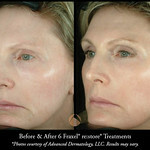 However, as with any resurfacing treatment, there is a very small chance of an infection or a skin wound leading to a scar. 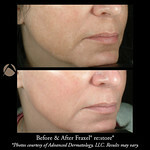 Another risk is a possibility of hypo (too little) or hyper (too much) pigmentation that is very uncommon. 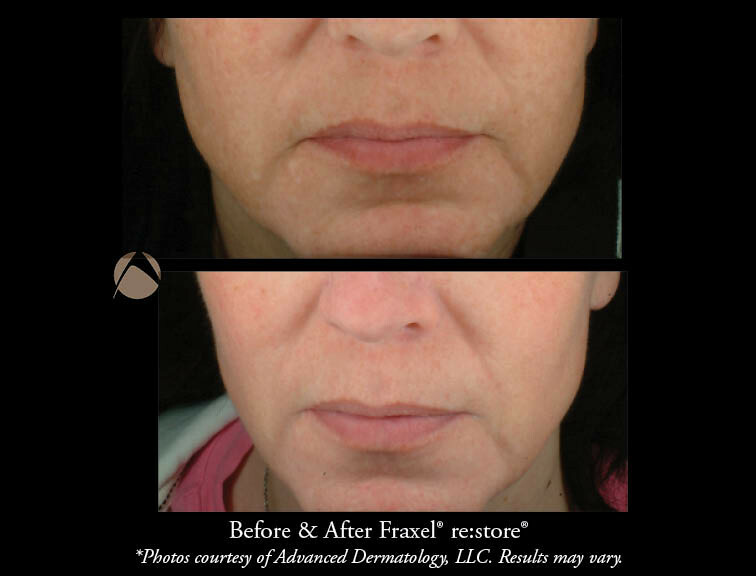 Usually treatable with prescriptions creams, chemical peels or further laser treatments, there is a <1% possibility that this could last forever. 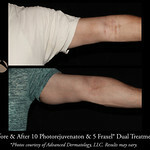 As part of the normal healing process some patients may develop increased blood vessels in the treated area. 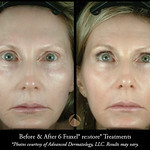 Although these usually resolve on their own with time, additional laser treatments can reduce their appearance more quickly. 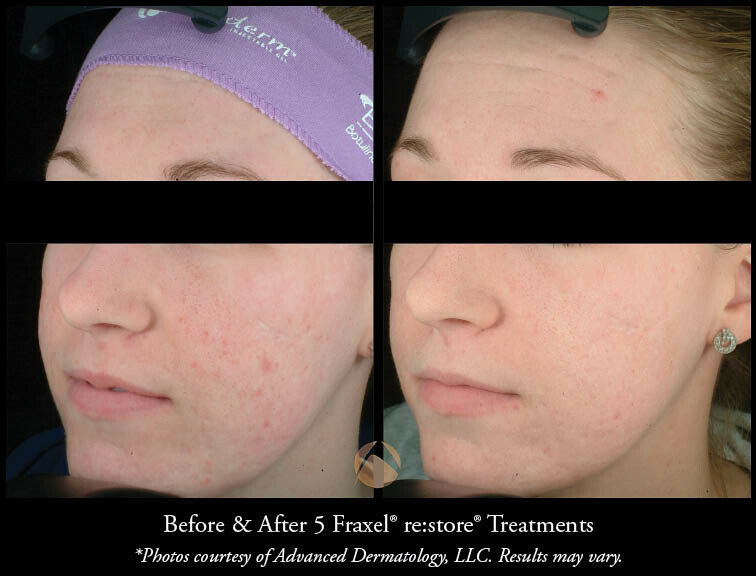 In addition if there is a history of acne or rosacea we often pre-treat with oral antibiotics as these conditions can be stirred up by this treatment. Your face will be red and have some swelling. Sometimes a burning sensation can occur for an hour or two. 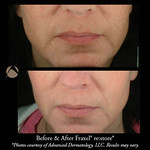 You may apply makeup or shave soon after treatment. Some patients are able to return to routine activities, including work and social obligations, the same day of treatment. 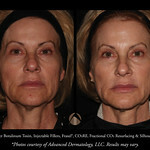 Others require a little more time, even up to a week depending upon their skin condition and treatment. It is important that you use a daily sunscreen with SPF 30 and zinc oxide during the entire time that you are undergoing these procedures and for a period of 6 months following. 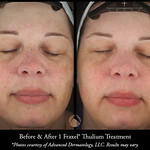 Also, try to avoid prolonged sun exposure as your risk for post treatment hypo- or hyper-pigmentation may increase. For added protection from sunlight, use wide-brimmed sun protective hats. 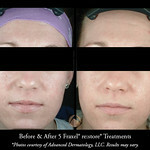 You may not go in a tanning booth at any time either before or during these treatments. 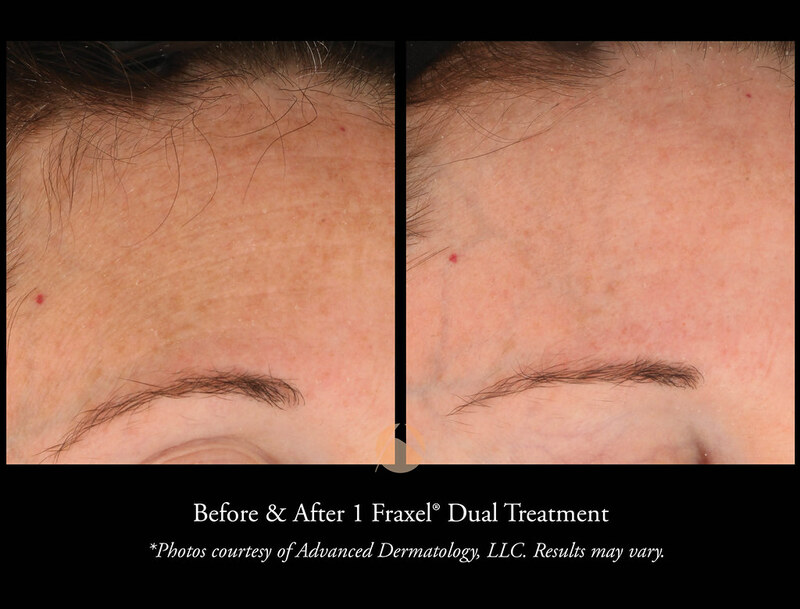 We will provide individualized recommendations for skin care before your first treatment to maximize your results and to minimize discomfort or complications. 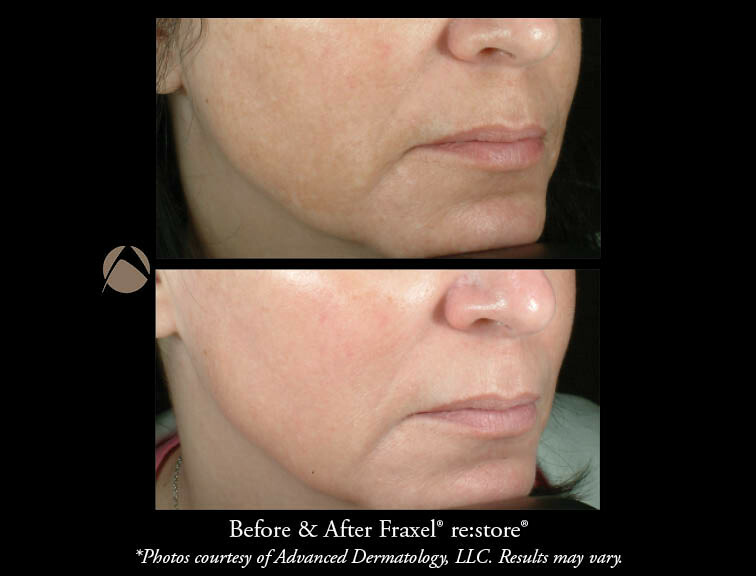 Alternatives to Fraxel Re:store Laser Treatment include , Clear + Brilliant, photorejuvenation with or without photodynamic therapy (Levulan), eMatrix, E2 E3, and CO2 fractional laser resurfacing (CO2RE). 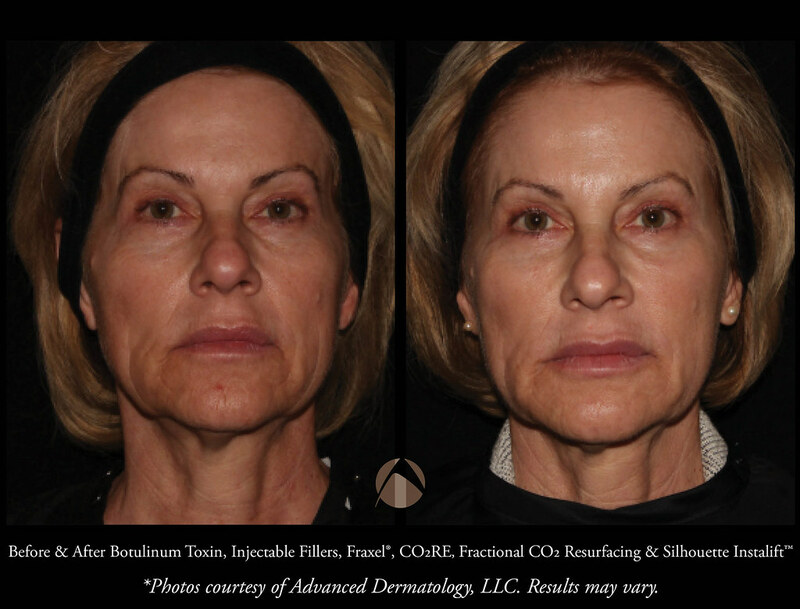 Other procedures that may benefit you to give you a more rejuvenated appearance would be injectable fillers, Botulinum Toxin, tightening devices and the Pan G Lift, that stimulates the lifting muscles of the face. 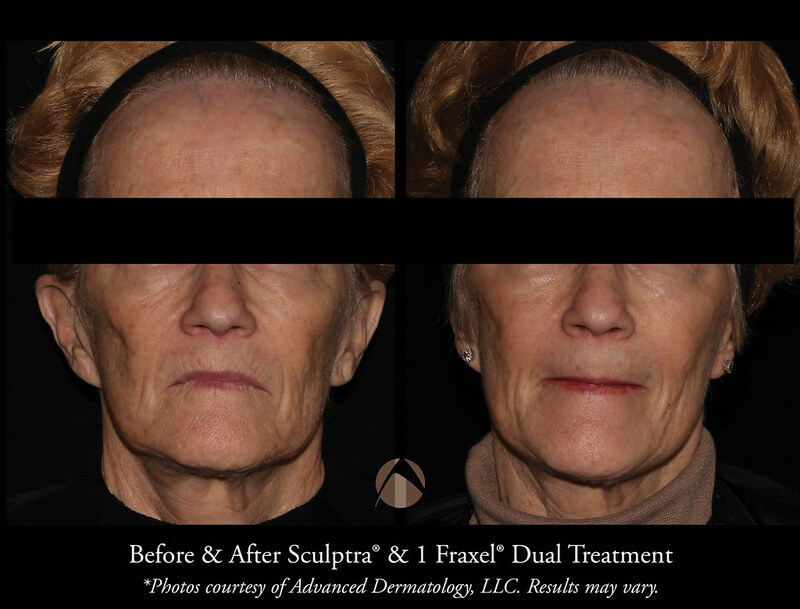 Any or all of these procedures could also be considered as complementary treatments, as we find that combination treatments yield the most optimal results. 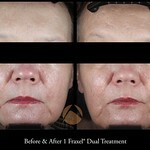 What is the cost of Fraxel Laser Treatment? 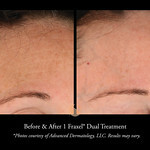 The fees for Fraxel Laser Treatments are based on the areas being treated. 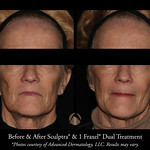 The fees are usually somewhere between $800-1200 per treatment. 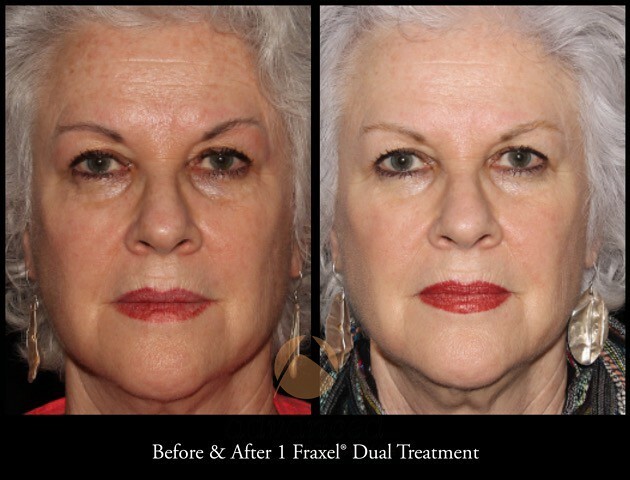 To learn more about Fraxel, please call 847-459-6400 or contact us to make an appointment with one of our cosmetic coordinators. 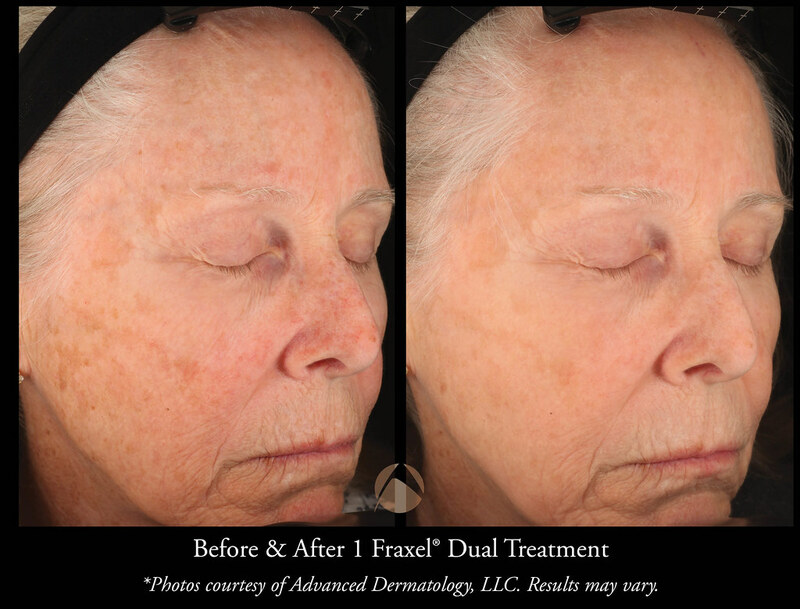 Fraxel Dual is FDA approved for wrinkles around the eyes (periorbital wrinkles), acne scars, surgical scars, age/sun spots (pigmented lesions), Melasma, Actinic Keratoses, and skin resurfacing.